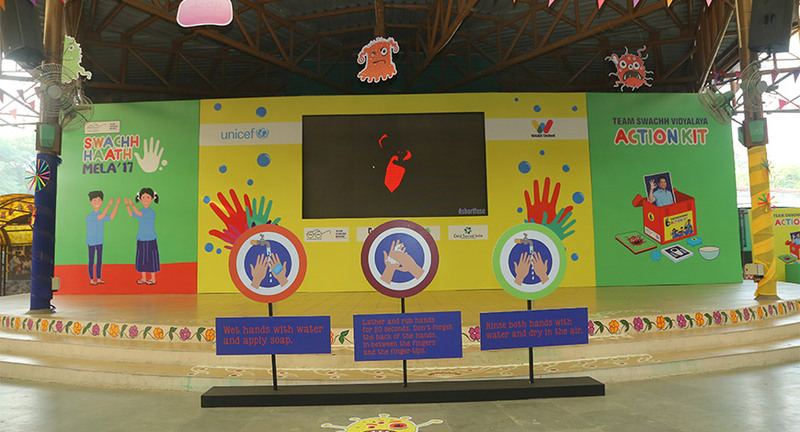 Team Swachh Bharat, the campaign co-led by UNICEF and WASH United, celebrated Global Handwashing Day by hosting the first ever Swachh Haath Mela on October 13, 2017 at National Bal Bhawan, New Delhi. The festival was planned and executed by experiential marketing agency, Fountainhead MKTG. 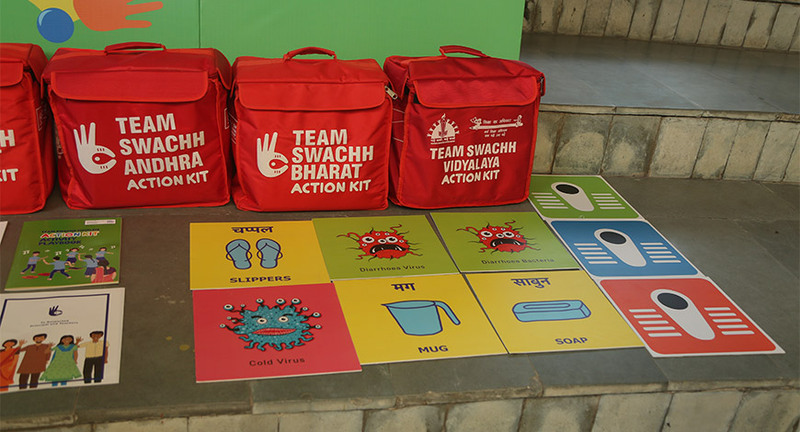 The programme was initiated to present thousands of school children with Swachh Bharat Action Kit, and other stakeholders (NGOs, & other associations working towards the health and hygiene of children across the country) through multiple recreational activities. Swachh Haath Mela welcomed approximately 1300 students, along with their teachers, from Delhi’s government schools. The informative event went on for 8 hours. The entire event was decorated with colorful buntings, installations, germ and soap hangings and cutouts. Information panels too were setup to educate children about the festival. 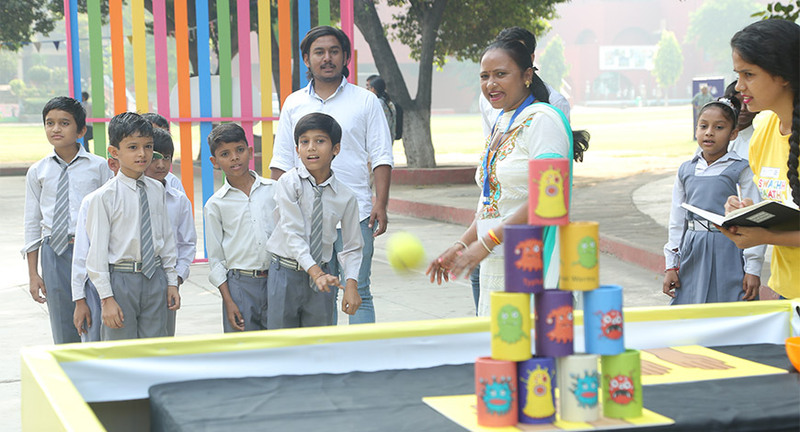 KILL THE GERMS: Students were encouraged to hit cans with a ball. The can represented germs and the ball, a soap. The objective of the activity was to encourage students to wash their hands with soap and water and therefore, defeat germs on their hands. MUSICAL TOILETS: The usual musical chair game was conducted, just with no chair but toilet seats made out of cardboard. The idea was to always use a toilet for defecation and to also, leave it clean for others to use. The motive to educated children about the same was accomplished. OBSTACLE RELAY: An obstacle relay race with germs being the obstacles was oraganised. The activity ahd all the adrenaline rush required, as student sprinted forward to beat and overcome the germs. “Keep your hands clean and practice healthy habits”, a message that came across effectively through this game. Post these games, the students along with their teachers were directed towards the DIY Zone, where these students were asked to draw their learnings from the days’ activities and create elements from the Action Kit. A specially choreographed hand-washing dance step was also taught to all students as part of this initiative. A special networking zone for educating and promoting the Action Kit amongst its various stakeholders was also setup. This zone had the Action Kit in display, with volunteers taking the guests at the zone through the elements in the kit. 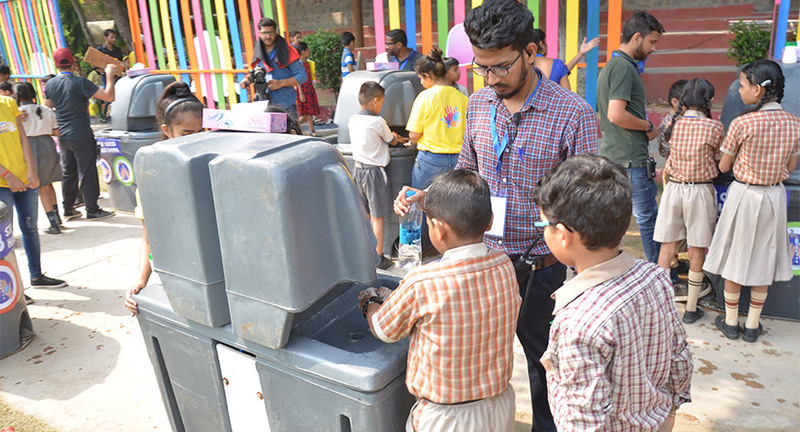 One of the key highlights of the event was the ritual of handwashing taught and practiced on the spot by all children after their day full of fun and activity in the open. For this a set of 10 branded hand-washing units were installed. Following this, the children were handed over a packet of quick healthy bits each and this marked the end of this festivity. © Copyright Everything Experiential 2016. All Rights Reserved.